94 m a s s a g e & b o d y w o r k m a y / j u n e 2 0 1 8 Homolateral gait unlevels the eyes, initiates head righting reflexes, and distorts balance. Cross-crawling helps organize the child's central nervous system. All photos courtesy Erikdalton.com. 1 2 technique MYOSKELETAL ALIGNMENT TECHNIQUES who prematurely encouraged the child to move from crawling to walking before a strong neurological bridge through the corpus callosum had been established. In others, things like traumatic injuries, bracing, prolonged inactivity, and lumbar fusion surgeries have shocked the body and jumbled nerve impulses, causing the brain to revert back to a previously mapped homolateral pattern. 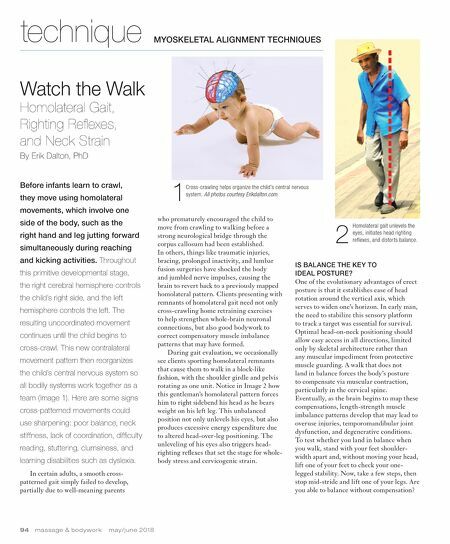 Clients presenting with remnants of homolateral gait need not only cross-crawling home retraining exercises to help strengthen whole-brain neuronal connections, but also good bodywork to correct compensatory muscle imbalance patterns that may have formed. During gait evaluation, we occasionally see clients sporting homolateral remnants that cause them to walk in a block-like fashion, with the shoulder girdle and pelvis rotating as one unit. Notice in Image 2 how this gentleman's homolateral pattern forces him to right sidebend his head as he bears weight on his left leg. This unbalanced position not only unlevels his eyes, but also produces excessive energy expenditure due to altered head-over-leg positioning. The unleveling of his eyes also triggers head- righting reflexes that set the stage for whole- body stress and cervicogenic strain. Watch the Walk Homolateral Gait, Righting Reflexes, and Neck Strain By Erik Dalton, PhD Before infants learn to crawl, they move using homolateral movements, which involve one side of the body, such as the right hand and leg jutting forward simultaneously during reaching and kicking activities. Throughout this primitive developmental stage, the right cerebral hemisphere controls the child's right side, and the left hemisphere controls the left. The resulting uncoordinated movement continues until the child begins to cross-crawl. This new contralateral movement pattern then reorganizes the child's central nervous system so all bodily systems work together as a team (Image 1). Here are some signs cross-patterned movements could use sharpening: poor balance, neck stiffness, lack of coordination, difficulty reading, stuttering, clumsiness, and learning disabilities such as dyslexia. In certain adults, a smooth cross- patterned gait simply failed to develop, partially due to well-meaning parents IS BALANCE THE KEY TO IDEAL POSTURE? One of the evolutionary advantages of erect posture is that it establishes ease of head rotation around the vertical axis, which serves to widen one's horizon. In early man, the need to stabilize this sensory platform to track a target was essential for survival. Optimal head-on-neck positioning should allow easy access in all directions, limited only by skeletal architecture rather than any muscular impediment from protective muscle guarding. A walk that does not land in balance forces the body's posture to compensate via muscular contraction, particularly in the cervical spine. Eventually, as the brain begins to map these compensations, length-strength muscle imbalance patterns develop that may lead to overuse injuries, temporomandibular joint dysfunction, and degenerative conditions. To test whether you land in balance when you walk, stand with your feet shoulder- width apart and, without moving your head, lift one of your feet to check your one- legged stability. Now, take a few steps, then stop mid-stride and lift one of your legs. Are you able to balance without compensation?